The best way to make memories is to learn how to “mark moments.” When moments are marked, memories are made. In the Old Testament, whenever something significant occurred between God and his people, he always had a way of “marking” the moment. When Abraham received a great promise from God (Gen. 12:7), he took time to build an altar as a physical reminder of a spiritual event. In other words, he “marked the moment.” He made the experience into a lasting memory. This was done so that he, his children and, one day, his children’s children would practice the Principle of Remembrance. God marks moments like no one else can. He marked a promise he made to Noah with a rainbow and one he made to Moses with a covenant finger-etched in stone. He marked a moment of his delivering power with the Passover Feast celebrated by many to this day. In the New Testament, in addition to Paul’s practice, even Jesus marked a moment in time for eternity. As he gathered with his disciples during the last week of his life and ministry on earth, he presented them with bread and wine and said: “Do this in remembrance of me (Luke 22:19).” Thus, he not only established an ordinance of the church, he did something even more personal – he created a memory as he marked a moment. And what a powerful impact that memory has had throughout the ages in the lives of Christians around the world. He wanted his spiritual family, his “brothers”, not to forget to remember. Good memories can be a gift from God to help heal our souls. Even the Prodigal Son did not begin to heal until he began to recall the “good memories” of what life was like under the care of his loving father: “When he came to his senses, he said, ‘How many of my father’s hired men have food to spare, and here I am starving to death! I will set out and go back to my father. . .” (Luke 15:17-18a). My wife, Pam, has a way of taking hold of the moments of life and making the most of them. 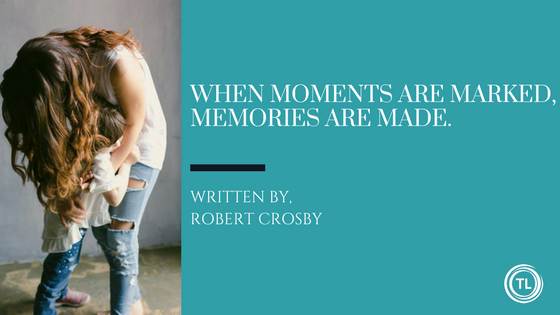 She is good at marking the moments or, as she prefers to put it, “embracing the moment.” As a husband and a dad, I am beginning to see how important it is to seize the moments God has given me with my wife and with my kids. If I don’t stop and mark the moments in life, memories will fail to be made. Number Two in this list challenges me the most: “I would reflect more.” When we take time to remember, we take time to “reflect.” In our haphazard busy work-a-day world, sharing memories of great times together as a couple or as a family has a great way of recharging our relational batteries. When a husband reminds his wife of a great date they once had. When a mom pops in a family video of how they spent an earlier Christmas together. When a dad looks into his daughter’s face and says, “I am so glad I get to be your dad.” When a wife expresses how much she appreciates the time her husband takes with her. Each of these is a way to mark a moment and to make a memory.